Createspace Independent Publishing Platform, 9781478296874, 220pp. "A Triumph Over Gravity "
"I myself experienced loss when I was a young girl. Sports were my outlet and helped me through some of the hardest times of my life. This book captured me cover to cover. I highly recommend Maggie Vaults Over the Moon " --Becky Holliday, Team USA Pole-Vaulter, USA Olympic Trials Silver Medalist, and Finalist at the 2012 London Olympics. "Every single person should be able to relate to Maggie in Maggie Vaults Over the Moon. We have all experienced loss, heartache or tragedy, but not all find a way to overcome. It doesn't matter if you are a pole-vaulter, male or female; it's about finding something in which you are passionate and not giving up. Maggie does just that-she finds her passion and it ends up taking her over the moon." --Jeremy Scott, USA Olympic Trials Silver Medalist and Team USA Pole-Vaulter at the 2012 London Olympics. "Maggie's inspirational story will make any girl feel like they can accomplish their dreams. This is a MUST read for any athlete, no matter what sport you compete in." --Taylor Marie Swanson, 2012 Kansas State High School Pole-Vault Champion. "Maggie Vaults Over the Moon shows a touching and realistic perspective of life's changes wrapped into one heartwarming story. It will captivate those who have lost loved ones and imagine being with them again. This inspiring tale celebrates the courage to turn tragedy and loss into something positive, and how the determination to master a sport can heal. The bits of pole vault history, technique, and struggle will keep the attention of vaulters for sure." --Doug Bouma, Editor, VAULTER Magazine. "This inspiring book comes along at a perfect time, on the 40th anniversary of Title IX and in the same year as women athletes dominated the 2012 London Olympics. 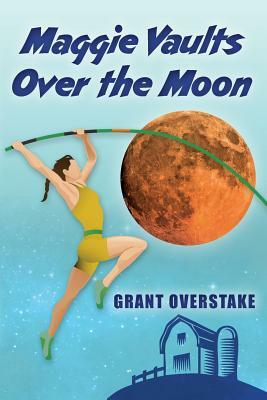 Girls who play sports and the coaches and families who support them will thoroughly enjoy Grant Overstake's warm, uplifting story. After reading it, we'll all wish we were pole vaulters like Maggie." --Christine Brennan, USA Today Sports Columnist, ABC News commentator and best-selling author of Inside Edge and Best Seat in the House. Overstake's novel exudes sweetness... it feels as if it takes place in another era, as it lacks the dark edge seen in other popular YA stories. ...Overstake's crisp style also gives the pole-vaulting scenes authenticity and tension. The story will most likely engage younger teenage girls, but its themes will resonate with anyone who has suffered profound loss.